At the appointed time Douglas and Lincoln entered the hall, the former taking a seat on the front row of benches and the latter advancing to the platform. 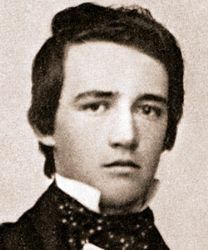 The two men presented a wide contrast in personal appearance, Lincoln being 6 feet 3 inches high, lean, angular, raw boned, with a complexion of leather, unkempt, and with clothes that seemed to have dropped on him and might drop off; Douglas, almost a dwarf, only 5 feet 4 inches high, but rotund, portly, smooth faced, with ruddy complexion and a lion-like mane, and dressed in clothes of faultless fit. When speaking he seldom moved from his first position, but notwithstanding his diminutive size he always seemed to fill the platform. It was my good fortune to accompany Mr. Lincoln during his political campaign against Senator Douglas, in 1858, not only at the joint debates, but also at most of the smaller meetings, where his competitor was not present. We traveled together many thousands of miles…Senator Douglas had entered upon his campaign with two shorthand reporters, James B. Sheridan and Henry Binmore, whose duty it was to ‘write it up’ in the columns of the Chicago Times. The necessity of counteracting or matching that force became apparent very soon, and I was chosen to write up Mr. Lincoln’s campaign. I was not a shorthand reporter. The verbatim reporting for the Chicago Tribune in the joint debates was done by Mr. Robert R. Hitt, late Assistant Secretary of State, and the present Representative in Congress from the Sixth district of Illinois. Verbatim reporting was a new feature in the journalism in Chicago, and Mr. Hitt was the pioneer thereof. The publication of Senator Douglas’ opening speech in that campaign, delivered on the evening of July 9, by the Tribune the next morning, was a feat hitherto unexampled in the West, and most mortifying to the Democratic newspaper, the Times, and to Sheridan and Binmore, who, after taking down the speech as carefully as Mr. Hitt had done, had gone to bed, intending to write it out next day, as was customary. The next stage brought us to Ottawa, the first joint debate, August 21, Here the crowd was enormous. The weather had been very dry and the town was shrouded in dust, raised by the moving populace. Crowds were pouring into town from sunrise till noon, in all sorts of conveyances, teams, railroad trains, canal boats, cavalcades and processions on foot, with banners and inscriptions, stirring up such clouds of dust that it was hard to make out what was underneath them. The town was covered with bunting, and bands of music were tooting around every corner, drowned now and then by the roar of cannon. Mr. Lincoln came by railroad, and Mr. Douglas by carriage, from LaSalle. A train of seventeen passenger cars from Chicago attested the interest felt in that city in the first meeting of the champions. Two great processions escorted them to the platform in the public square. But the eagerness to hear the speaking was so great that the crowd had taken possession of the square and the platform, and had climbed on the wooden awning overhead, to such an extent that the speaker and the committees and reporters could not get to their places. Half an hour was consumed in a rough-and-tumble skirmish to make way for them, and, when finally this was accomplished, a section of the awning gave way with its load of men and boys, and came down on the heads of the Douglas committee of reception. But fortunately, nobody was hurt. At the conclusion of the Ottawa debate, a circumstance occurred which, Mr. Lincoln said to me afterwards, was extremely mortifying to him. Half a dozen Republicans, roused to a high pitch of enthusiasm for their leader, seized him as he came down from the platform, hoisted him upon their shoulders, and marched off with him, singing the ‘Star Spangled Banner’ or ‘Hail Columbia,’ until they reached the place where he was to spend the night. What use Douglas made of this incident is known to readers of the joint debates. He said a few days later, at Joliet, that Lincoln was so used up in the discussion that his knees trembled, and he had to be carried from the platform, and he caused this to be printed in the newspapers of his own party. Mr. Lincoln called him to account for this fable at Jonesboro. White wrote down a portion of Mr. Lincoln’s Beardstown on August 12, 1858 speech from memory. White served as editor of the Chicago Press and Tribune after the Civil War and later served as editor of the New York Evening Post. His friendship with Henry Villard, a financier who had also covered Mr. Lincoln as a journalist in 1858, served White in good stead when Villard bought the Post in 1881 and installed his friend as the editor. “Horace White”, Journal of the Illinois State Historical Society, October 1916, (New York Evening Post), p. 389. “Horace White”, Journal of the Illinois State Historical Society, October 1916 (New York Evening Post), p. 388. Horace White, “Abraham Lincoln in 1854”, Address before Illinois State Historical Society, January 1908, p. 10. Rufus Rockwell Wilson, editor, Horace White, “Lincoln Among His Friends”, New York Evening Post, February 12, 1909, p. 170. Horace White, “Abraham Lincoln in 1854”, Illinois State Historical Society, January 1908, p. 10. William H. Herndon and Jesse W. Weik, Herndon’s Life of Abraham Lincoln, p. 88-89. Douglas L. Wilson and Rodney O. Davis, editor, Herndon’s Informants, “Letter from Horace White to William H. Herndon, May 17, 1865”, p. 4. Horace White, Journal of the Illinois State Historical Society, October 1916 (New York Evening Post), p. 391. Douglas L. Wilson and Rodney O. Davis, editor, Herndon’s Informants, “Letter from Horace White to Jesse W. Weik, March 7, 1890,” p. 698. Douglas L. Wilson and Rodney O. Davis, editor, Herndon’s Informants, “Letter from Horace White to William H. Herndon, May 17, 1865,” p. 4.